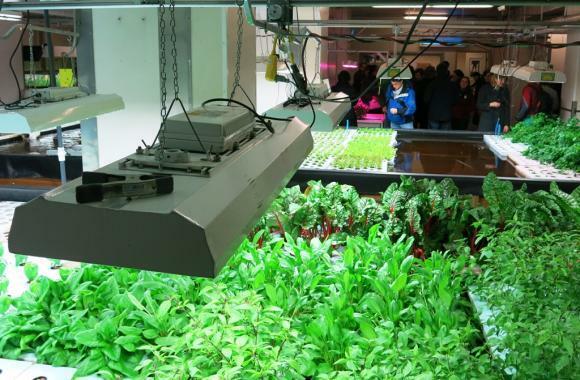 Large banks of fluorescent lamps provide the spectrum of light that keeps the floating beds of plants alive year-round in The Plant Chicago, a vertical farming facility. Farmers are making inroads supplying local food to hungry city foodies, but many producers are trying to grow more food inurban centers. City real estate is at a premium, so some producers are finding more space by using what’s called “vertical farming,” and going up rather than spreading out. Growers across the country are heading indoors, using greenhouses and hydroponics – growing plants in a water and nutrient solution instead of soil and using lamps to replace sunlight. Vertical farming takes that to a new level. But what exactly is a “vertical farm”? Do an internet search and you’ll get some very different pictures of what that term means. Some conceptualized vertical farms are like space-age skyscrapers, while others are simple, boxy structures with racks of artificially lit plants stacked to the ceiling. The man widely credited with bring the term into the mainstream says it’s simple: any high-tech greenhouse that goes up rather than out. Despommier is among the futurists who argue that the booming global urban population will make self-sustaining urban food systems a necessity. “I can see the urban landscape parasitizing the rural landscape for its resources,” Despommier said, adding that he seesdensely populated areas in Europe, Korea and Japan benefitting most from his vertical vision. But critics of that vision say vertical farming won’t be able to produce the scale of food a growing population will need – at least not without massive amounts of energy and other inputs. In Chicago, entrepreneur John Edel is working hard to show skeptics that garbage itself can fuel vertical farming, making it more sustainable. With a grant from the State of Illinois, he’s installing a giant anaerobic digester that will convert truckloads of food waste into biogas, burned onsite to keep the lights on. Edel’s vertical farm, The Plant Chicago, looks different than the architectural renderings of towering green skyscrapers you’ll find on the web. In 2010, Edel bought a four-story, 94,000 square foot warehouse in a bankruptcy sale. The hulking red brick facility, built in the 1920s next to Chicago’s Union Stockyards, used to process bacon and ham. Now it is home to 11 small-scale food businesses, from bakers to kombucha brewers to aquaponic farms growing greens and fish for area restaurants. Edel’s operation, which he calls a “social enterprise”, is trying tocreate a replicable model of closed-loop, energy-independent urban food production. He’s less concerned about competing for space in a grocery store produce aisle than he is about raising awareness. But FarmedHere, a commercial vertical farm in Chicago, sells basil and other greens to upscale grocery chains throughout the city and suburbs. And Green Spirit Farms recently inked a dealto expand its vertical farming operation to an empty factory near Scranton, Pa. At 300,000 square feet, it would become the largest in the nation. The move to grow more food indoors has also caught on for pharmaceuticals. The Defense Department funded a vertical farm in Texas that grows plants for vaccines and cancer-fighting drugs. Still, most vertical farming operations today, even with increased efficiency due to LED lighting, have a hefty electric bill and carbon footprint. Farms aren’t all white picket fences and red barns anymore. And in the future, they might be in skyscrapers. This story originally aired as part of Under the Microscope, a weekly program about science, health, and technology in mid-Missouri.